Medical scientists felt threatened by initiatives such as the Anti-Vivisection Hospital, and were concerned that anti-vivisection groups had more money to spend, and more public support, than they did. To co-ordinate their response to a second Royal Commission on Vivisection, set up to address the antis concerns, UCL physiologists set up the Research Defence Society. During the first half of the twentieth century, the RDS waged an effective campaign: Mobilising support in parliament and among the medical profession, and taking action against anti-vivisectionists. Their successes included blocking the Dogs Protection Bill and arranging for the charitable status of anti-vivisection to be revoked. At the end of the nineteenth century, medical experimenters were on the defensive. Although the 1876 Act had done nothing to reduce animal use, and Britain’s physiologists were confident they could ensure it was ‘harmlessly administered’ by putting ‘effectual pressure upon officials…’, 1 it was still more restrictive than the laws of any other European nation, and more intrusive than any of them wanted: one American observer thought it ‘significantly handicapped the teaching (if not the practice) of British physiology’. 2 Anti-visectionists naturally claimed the Act did not go far enough, and used initiatives such as anti-vivisection hospitals and pamphlet wars to raise doubts over whether experiments on animals were necessary, and fears that they would inevitably lead on to human experimentation. The nineteenth-century medical profession had been able to extract some positive publicity from the bitter dispute over vivisection by presenting it as a difficult and demanding task that required great fortitude and commitment to science. Flouting conventional sensibilities had, after all, served medics well in the recent past, when body snatching scandals had introduced the trope of the ‘mad’ scientist, a heroic figure who transgressed moral boundaries not for personal gain but to win valuable knowledge for the benefit of mankind. The public were willing to be persuaded that the anatomist’s noble ends might justify the base and sometimes illegal means used to obtain corpses, though their response was strangely ambivalent: angry crowds called for body-snatchers to be hanged, while anatomy shows became so popular that the subject ‘turned to gold’. 3 The furore certainly made it clear to everyone that, after the Anatomy Act, doctors enjoyed privileged access to a body (of course) of knowledge that was denied to laymen, who had neither the opportunity nor the stamina to attend the dissections necessary to obtain it. In the late-nineteenth century, vivisection assumed a similar function, and vivisectionists, like anatomists before them, enjoyed an ambiguous reputation as both perpetrators of atrocities and pioneers of science. In the twentieth century, however, when vivisection was set up as one of the pillars of experimental medicine, it could hardly remain the prerogative of a few eccentric, taboo-breaking innovators. It had to be normalized within a medical culture that based its intellectual and moral authority on the intimate relationship between professional knowledge and laboratory experimentation. Most of the other RDS members were active researchers. Sir Victor Horsley, FRS, who had trained at UCL before becoming Professor of Surgery there, was a man of strong social principles—a temperance reformer and supporter of women’s suffrage—and was particularly noted for his kindness to patients. In writings such as ‘The Morality of Vivisection’, he argued that excessive feeling for animals was displacing proper concern for humans. His own concern for humanity led him to vivisect over 3000 animals (his work on gunshot wounds in dogs involved shooting them in the head), a record hotly criticised in the correspondence columns of The Times. He had every reason to resent anti-vivisectionists, having been professor at the notorious Brown Institute in London’s Vauxhall (a post previously held by Burdon-Sanderson, author of the vivisectors’ handbook), an institution the BUAV and others had strenuously, though unsuccessfully, campaigned to close. 12 It was Horsley who had helped persuade his colleague Bayliss to bring the so-called ‘Brown Dog’ libel action against Stephen Coleridge in 1903 for reading out an extract from The Shambles of Science at a public meeting—UCL men were particularly riled by the chapter entitled ‘Fun’, in which Lind af Hageby described their ‘jokes and laughter’ during experiments. The second Royal Commission’s report was a foregone conclusion given its skewed composition: naturally enough, there were several vivisectors on the panel, but the BUAV’s attempt to have Walter Hadwen appointed was rejected on the grounds that as an anti-vivisectionist, he would be biased. Between 1906 and 1912 the commission sifted a large amount of evidence, before unsurprisingly endorsing the status quo. Their major recommendation was the usual one for a public enquiry desirous of seeming to act while in fact doing nothing: they set up a committee to take over the AAMR’s role of advising on licensing, which in the BUAV’s view made no difference. While the Commission was still pondering the evidence, vivisection had received a boost from the 1911 National Insurance Act, which set aside state (i.e., taxpayers’) money to fund medical research. 18 Two years later, the Medical Research Committee and Advisory Council (later the MRC) was formed to control how the money was allocated. As a result, Frances Power Cobbe had set up the British Union for the Abolition of Vivisection, which demanded a total and immediate ban on all animal experiments, while the NAVS, under Stephen Coleridge’s leadership, was prepared to accept lesser measures in the interim. The choice between principled total abolition and pragmatic gradualism was to prove an enduring source of tension for the movement. Ironically, peace initiatives such as the League of Nations, formed in 1920 to prevent future conflicts, tended to lead to more experiments on animals, since improvements in ‘modern medicine’ were hyped as a means to alleviate the social hardships that led to war. 46 The post-war conflict in which Europe was now engaged was a war against poverty and disease, and it was being fought with modern, scientific weapons developed in the clinic and laboratory. Pro-vivisection literature made increasing use of this military imagery, with the RDS reporting what had been learned from the ‘sacrifice’ of laboratory animals in a series of pamphlets entitled The Fight Against Disease. Like any war, it needed large sums of money to be raised at a national level: to this end, the British Empire Cancer Campaign was founded in 1923, to supplement the work of the ICRF and MRC, who initially considered it a rival. The idea that science held the keys to health, prosperity and peace naturally fostered a positive attitude on the part of the public towards laboratory research: at the Efficiency Exhibition in Olympia there were long queues at the Middlesex Hospital stall as people waited to look down the microscopes. 47 The British experienced nothing like the reaction to laboratory-based work that had been seen in Germany, where a so-called ‘crisis of medicine’ occurred as many ordinary people lost their trust in ‘mechanistic’ medicine and turned instead to heterodox practitioners of alternative medicine, whose treatments seemed more natural and whose methods appeared more patient-centred. 48 In Germany, vivisection became a symbol of the failure of scientific medicine to respect the ideals of the traditional healer, and the public responded enthusiastically when the rising National Socialist Party adopted an anti-vivisection policy. With support for anti-vivisection groups on the wane, the RDS turned its attention to ensuring that the income derived from legacies as wealthy anti-vivisectionists died off was minimised. In a landmark legal case in 1928, the RDS appealed against a legacy of £200,000 being used to set up a trust to fund the Beaumont Animals Benevolent Society. 51 The bequest was as bizarre as it was generous, but the Court of Appeal ruled that its purpose—to create a sanctuary where all kinds of animals could live undisturbed by humans—was not charitable, since the Court reckoned that this would provide no benefit to the public. 52 Although this so-called Grove-Grady case was not related to anti-vivisection, the judgement did establish a valuable principle, from the RDS’s perspective, that money given for the benefit of animals alone could not be considered charity. Had the court decided otherwise, wrote its secretary, it ‘would have given us endless trouble’, 53 as it was, the decision paved the way for a future ruling that anti-vivisection too could not be a charitable cause. The RDS did not receive government assistance, remaining essentially a private lobby group for vivisectionists. New license holders received a letter inviting them to join, but neither the identities of those who did, nor the total number of members, was made public, though there must have been far fewer than even the smallest anti-vivisection society, and the RDS’s annual income was less than a thousand pounds. Considering its modest budget, the influence it was able to exert was impressive. In 1934, the honorary secretary, G.P. Crowd, summarised its principal achievements: the defeat of the Dogs Protection Bill, the defence of University College in the dog stealing case, changing the attitude of the RSPCA to research, blocking the Grove-Grady bequest, and protecting research at the Royal Veterinary School. 56 A closer examination of the first of these, the long and frustrated progress of the Dogs Protection Bill in its various forms, shows how the RDS was able to influence parliament and collaborate effectively with the BMA and other pro-vivisection groups. The Dogs Protection Bill was conceived as a means to break down the vivisectionists’ defences at their weakest point, necessarily forgoing the support of total abolitionists (though the BUAV backed it) in the hope of winning a tactical victory on behalf of the species most adept at appealing to human sympathy. The popularity of dogs as domestic companions as well as their usefulness as working animals made their use as experimental subjects seem particularly objectionable; as Lord Dowding put it, ‘the dog has no aim in life other than to love and serve humanity’, and the relationship between dogs and humans was often assumed, with good reason, to be a special one. 57 Dogs had had their own anti-cruelty lobby since 1891, when the National Canine Defence League was founded by the breeders of show dogs, to protect dogs from all kinds of cruelty, from vivisection to muzzling. The advocates of dog-specific anti-vivisection legislation left themselves open to the criticism that they were acting on an irrational, sentimental bias towards a favourite pet, and indeed the positions of both sides in the dogfight were not far removed from hypocrisy. Experimenters pretended there was nothing special about dogs, but then admitted they preferred them because they were particularly cooperative and biddable, even under torture, an admission condemned by anti-vivisectionists as the heartless betrayal of a friend and helper. Dog lovers, however, had little to be proud of; one reason that dogs were such a popular laboratory animal being that they were readily obtainable: Britain was home to a large underclass of strays and mongrels which, though legally protected from vivisection by the 1906 Dogs Act, were, in reality, like pauper cadavers a century before, worthless to all except experimenters, who could easily acquire them for money. In 1906, when the BUAV sought support for a dogs protection bill (not an entirely novel idea, since a ‘Dog Protection Bill’ had been contemplated as long ago as the 1840s to prevent the theft of ‘fancy dogs’ for export), 58 the public, understandably averse from the idea of anyone experimenting on what they saw as pets, responded enthusiastically, and the BUAV was able to present the Home Secretary with a petition weighing a quarter of a ton, nine miles long, and with over 400,000 signatures. 59 Although the size and weight of this monster petition were obviously inflated for dramatic effect, it still stands as one of the largest written petitions in English history. The BUAV had appealed to the public because a similar bill introduced in the House of Commons the previous year had failed to progress. 60 For those unversed in the labyrinthine complexities of the British parliamentary system, bills receive a nominal ‘first reading’—in which the title is read out and the bill is ordered to be printed—followed by a second reading when they are debated and voted on. If they are passed, there follows a committee stage at which amendments are made and voted on, before the bill may proceed, time permitting, to a third reading and another vote. Once a bill has been passed by the Commons, it must then undergo a similar process in the House of Lords, and only when this is finally complete is the bill passed for royal assent, at which point it becomes law. Few private member’s bills, i.e., those not sponsored by the government, ever become law, unless the government aids their passage. The medical lobby continued to present vivisection as both essential and innocuous. A deputation from the Royal Society of Medicine told the Home Office that ‘in the absence of infection the wounds [of vivisected dogs] were not painful’, but it is inconceivable that anyone with medical experience actually believed this; the point was well made by anti-vivisectionists that scientists were never willing to have these ‘painless little operations’ performed on themselves. 72 The deputation also appealed to the national interest by claiming that ‘success in war or in industry was bound up in experimental research’, which gave the government a political and financial excuse for permitting as many experiments as possible, while making anti-vivisection seem to go against the national interest. If one can penetrate their execrable style, these verses neatly encapsulate the main argument against vivisection: it was inhumane and so could not benefit humanity, or be a path to knowledge, as only the morally ignorant would perform it. The RDS seldom responded to religious or philosophical arguments, at times seeming genuinely baffled by them, and certainly did not rely on them to defeat the Dogs Protection Bill, arranging instead for their supporters in the House of Commons deliberately to prolong the proceedings so the bill would run out of time, a not uncommon parliamentary tactic. 76 The Bill, however, showed no signs of going away, and had yet another first reading in 1921. Throughout the inter-war period, the BMA staunchly opposed all parliamentary measures aimed at restricting vivisection. 84 In 1922, 1924 and 1930 Joseph Kenworthy MP (1886–1953) tried to introduce a bill on behalf of the BUAV to prevent National Insurance money (a form of income tax) being spent on vivisection, but the leaders of the BMA (without consulting their membership) rallied medical MPs to deny the bill parliamentary time. 85 Later in the year, the BMA’s Secretary asked local branches to lobby their parliamentary candidates not to give the anti-vivisection pledge that some voters wanted. Included with the request was a list of MPs—67 out of a total of 615—whose anti-vivisection views were so well known that it was thought not worthwhile to approach them. All but six were members of the labour party. The repeated thwarting of the Dogs Protection Bill shows the strategic effectiveness of mobilising medical and parliamentary influence in support of animal experimentation. The RDS had less money to spend than the anti-vivisectionists, no donations from the public, and little popular support: it would have been impossible for them to muster a substantial petition in favour of experimenting on dogs, stray or otherwise. 90 However, they were able to persuade most of the few dozen medically and scientifically trained members of the House of Commons to oppose anti-vivisection bills whenever they arose. That these elected representatives had no qualms about ignoring public opinion reflects the paternalistic nature of medical science, as well as politics, at the time. Perhaps they decided that animal experimentation was for the good of the British people, whether they wanted it or not, though those MPs with connections in the research industry might be suspected of self-interest. Whatever their motives, pro-vivisection parliamentarians had the distinction of ignoring some of the largest petitions ever presented to the British government. The involvement of the BMA was important in persuading both politicians and public that the nation’s health and prosperity depended upon animal research. Led by a generation of doctors trained to accept laboratory experiments as the basis of medical knowledge, the Association treated any threat to vivisection as a threat to their profession, which they countered by producing, on demand, pro-vivisection statements to suit the RDS’s purposes. 91 In common with the RDS and the anti-vivisection lobby, the BMA did not limit its statements to answering questions of fact, but gave strong ideological support to a position that it regarded as non-negotiable. University College London was among the dog dealers’ best customers. Its professors included some of Europe’s most distinguished physiologists, whose students were exposed to a diet of experimental physiology far in excess of anything they needed to learn medicine: by the 1940s they were receiving a total of over 300 h of practical teaching in experimental physiology, around ten times more than in any present day medical school. 95 Obtaining sufficient animals for research and teaching on this scale was challenging, and while London, like any big city, had plenty of stray dogs, it was illegal under the 1906 Dogs Act to give or sell them to a laboratory. Dogs for vivisection had to be purchased from dealers, though as the provenance of any given dog was almost impossible to establish, the dealers found it easy to flout the law. You [Hewett the dog seller] are no doubt a cruel and unscrupulous man, and anything I can do to stop this sort of thing I will. I must not say too much because the people who employ you are not here and are not represented. Anyone who has heard this case must have a feeling of considerable uneasiness as to what is taking place. I have been told that a dog-stealer is employed by this school [University College] to supply them with dogs for physiological experiments.… It has been often said in these Courts that if there were no receivers there would be no thieves. At 8 a.m. two valuable pedigree dogs are missed from outside a house. At 9 o’clock they are taken to this school in a sack under circumstances of great cruelty, and in 24 h they would have been dead. No questions would have been asked. It must raise a feeling of considerable alarm among animal lovers to find that this has been going on for some time. A boy of fourteen, who said he was ‘animal attendant’ at University College, said he had known the defendant for about four weeks. He (the defendant) helped a man named Jackson to fetch dogs to the college. Counsel: Mr. Jackson often supplies dogs for the college?—Yes. He brought two on November 19?—Yes’. The ‘University of London Animal Welfare Society’, set up by Starling to demonstrate that UCL took a responsible approach to research, 102 sometimes had to arrange for dogs to be nursed back to health to make them fit enough for vivisection, but had never questioned the vendors about why they were delivered in such a poor state. 103 Lord Banbury’s allegations of a cover-up seem to have been warranted. When one medical MP commended the use of dogs in research on the grounds that they were cheap, this suggested, said Banbury, that they were being supplied illegally: ‘Of course if you steal the dogs you do not pay much for them’. The BUAV would scarcely have been so naïve as to have expected a conviction; their motive was presumably to cause a scandal, and in this they succeeded, for even after Verney was acquitted on the legal technicality that he had not actually been in possession of the dog whilst it was in a cage in his department, the name of University College was still in the news for all the wrong reasons. 111 Questions were asked in the House of Commons and it made headlines that the College had ‘used’ 1,147 dogs in the past two years. 112 The inevitable public reaction followed, and the College received a flurry of letters: from anti-vivisection ladies, berating them for callousness and threatening divine retribution (‘I am sorry for all vivisectors when their time comes to leave this world!’); from the owners of lost dogs, pleading for the professors to look in their laboratory cages; from people offering to sell unwanted dogs to the physiologists; and even one from a lady offering to sell her own body for research. One man who had sent a puppy to the vet to be destroyed only to discover that the lad who had taken it had sold it to a dealer ‘for the sake of the money he gets from the Hospitals for vivisection’ pleaded to be allowed to buy the dog back, to spare her further ‘misery’. One of the most frequent criticisms of anti-vivisectionists between the wars was that they were motivated by sentiment and not logic; a criticism based, I have argued, on a paradigm of dispassionate, amoral science which, though prevalent, was still far from commanding universal assent. It might have been expedient to vivisect strays, as it had been to dissect paupers, but was it right? There were many in the anti-vivisection lobby whose feelings told them it was not. Vivisectionists, however, wielded influence where it counted. It was practically impossible to join the staff of a large teaching hospital if one was opposed animal experiments, and it was from this metropolitan élite that the leaders of the medical profession—presidents of the medical royal colleges and directors of research institutes—were drawn. They pronounced with authority that vivisection was necessary for medical progress, and it was difficult for laypeople or rank-and-file doctors to gainsay them. The fight for effectively unrestricted vivisection was won in the courts and parliament by clever tactics and collusion between those with vested interests. It is a moral certainty that the staff of University College knew that some of the dogs they purchased were stolen, but the RDS’s lawyers correctly argued that as the physiologists had not technically been in possession of the dogs, they could not be guilty of receiving stolen goods. Parliamentarians knew that the public was opposed to vivisection, but the RDS and BMA could count on the support of enough members with medical interests to ensure that legislation to curb it was blocked at every stage, in the knowledge that, since animal experimentation was believed to contribute to national prosperity and security, no government would want anti-vivisection legislation to become law. With legal challenges to vivisection blocked by parliament and the courts, and a mood of optimism that looked to scientific progress to bring peace and prosperity, anti-vivisection was beginning to look like a lost cause whose supporters were reactionary and selfish, putting their personal feelings before the interests of their own species and their own country. It would take the great depression of the 1930s to revive the link between radical politics and animal welfare, as the state’s (mis)treatment of animals once more became a surrogate for its failure to protect its own citizens. ‘A member of the Provisional Committee’ (letter), BMJ, 1 (1882), 599. A. Flexner, Medical Education in Europe: A Report to the Carnegie Foundation for the Advancement of Teaching (New York: Carnegie Foundation, 1912), 120–7 (Flexner 1912). A.W.H. Bates, ‘Anatomy on trial: itinerant anatomy museums in mid-nineteenth century England’, Museum History Journal, 9 (2016), 188–204 (Bates 2016). Emma Hopley, Campaigning Against Cruelty: the Hundred Year History of the British Union for the Abolition of Vivisection (London: BUAV, 1998), 12–13 (Hopley 1998). ‘The Home Office report on experiments on living animals performed in 1906’, Lancet, 1 (1907), 1502. Sometimes misreported as Harvey Cushing of the Johns Hopkins Hospital in Baltimore, who was a great friend of the RDS and wrote in 1913 that ‘I may have said more than was necessary in regard to experimentation upon animals and the handicap which has been put upon British medicine by ill-advised legislation, but the subject is not one for silence if speech can in any measure lend encouragement and support to the work of the Research Defence League…’ Harvey Cushing, Realignments in Greater Medicine… (London: Henry Frowde, 1914), 5 (Cushing 1914). Minute book, 27 January 1908, Well SA/RDS/C1. Memorandum from Paget, 21 May 1917, Well SA/RDS/C1. C.S. Sherrington, ‘Paget, Stephen (1855–1926)’, rev. M. Jeanne Peterson, Oxford Dictionary of National Biography (Oxford: Oxford University Press, 2004). http://www.oxforddnb.com/view/article/35360, viewed 9 Aug 2015 (Sherrington 2004). Hopley, Campaigning Against Cruelty, 10. The best history of hydrophobia in England dodges the question by refusing to countenance retrospective diagnosis, but the work of Pasteur and others cannot be properly evaluated without considering whether their diagnoses of hydrophobia were rabies or something else: Neil Pemberton and Michael Worboys, Mad Dogs and Englishmen: Rabies in Britain, 1830–2000 (Basingstoke: Palgrave Macmillan, 2007) (Pemberton and Worboys 2007). Austin Bradford Hill and Brian Hill, ‘The life of Sir Leonard Erskine Hill FRS (1866–1952)’, Proceedings of the Royal Society of Medicine, 61 (1968): 307–316 (Hill and Hill 1968). ‘Obituary: Charles Edward Beevor, MD, FRCP Lond’, BMJ, 2 (1908), 1785–1786. The Fight Against Disease, n.d. , 11. Hopley, Campaigning Against Cruelty, 23–5. Minute book, 21 May 1908, Well SA/RDS/C1. In ‘old’ money there were 12 pence (d) in a shilling and 20 shillings (s) in a pound. Half a crown was 2s 6d. Chen-hui Li, ‘Mobilizing Christianity in the anti-vivisection movement in Victorian Britain’, Journal of Animal Ethics, 2 (2012), 141–61 (Li 2012). Kensington branch Minute book, 17 May 1910, Well SA/RDS/C16. Minute book, 23 June, 19 August, 20 October 1908, Well SA/RDS/C1; RDS, The Fight Against Disease, n.d. , 12. Minute book, 5 and 11 January 1909, Well SA/RDS/C1. Animals Defender and Zoophilist, 20/21 (1900), 165. Richard D. Ryder, Victims of Science: The Use of Animals in Research (London: Davis-Poynter, 1975), 22 (Ryder 1975). ‘Anti-vivisection scene’, Daily Mail, 6 October 1910 (Anti-Vivisection Scene 1910). Minute book, 22 March, 17 May 1909, Well SA/RDS/C1. Minute book, 19 July 1909, 24 October 1928, p. 119, 24 October 1934, p. 159, Well SA/RDS/C1; SA/RDS/C2; Kean, Animal Rights, 149. Minute book, 1 February, 5 July 1909, Well SA/RDS/C1. Minute book, 18 July 1910, Well SA/RDS/C1; Niven, History of the Humane Movement, 89. Minute book, 19 July and 14 November, 1910. Hopley, Campaigning Against Cruelty, 16. Ulf Schmidt, ‘Justifying chemical warfare: the origins and ethics of Britain’s chemical warfare programme, 1915–1939’, in David Welch and Jo Fox (eds) Justifying War: Propaganda, Politics and The Modern Age (Basingstoke: Palgrave Macmillan, 2012), 129–158, on pp. 140–141 (Schmidt 2012). ‘Experiments on living animals’, Lancet, 2 (1916), 440. ‘Experiments on living animals’, Lancet, 1 (1902), 1617–1618. M. Beddow Bayly, ‘The ill-effects of vaccines’, Animals’ Defender, 60 (1941), 95 (Bayly 1941). ‘Anti-Vivisection in the war’, The Fight Against Disease (1930), 10–11; Hopley, Campaigning Against Cruelty, 26. ‘Physiology during the war’, The Fight Against Disease, January 1922, 2. ‘Anti-Vivisection: an enemy of the people’, The Fight Against Disease (1927), 1–3. RDS minutes, 19 February 1924, 59, Well SA/RDS/C2; The Fight Against Disease (1923), 1. Letter from Paget to the RDS, 20 October 1920, Well SA/RDS/C2. ‘Notes and comments’, The Fight Against Disease (1925), 11. 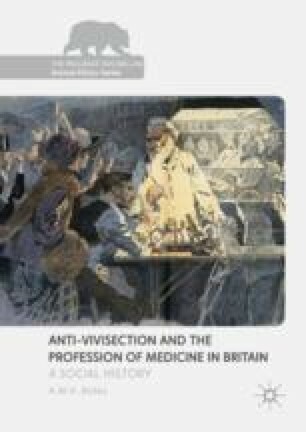 Debbie Tacium, ‘A history of anti-vivisection from the 1800s to the present: part II (1914–1970)’, Veterinary Heritage, 31 (2008), 21–5 (Tacium 2008). Schmidt, ‘Justifying chemical warfare’ (Schmidt 2012). Hopley, Campaigning Against Cruelty, 27. The Fight Against Disease, n.d. , 2–3. Carsten Timmermann, Weimar medical culture: Doctors, Healers, and the crisis of medicine in interwar Germany, 1918–1933. PhD, University of Manchester (1999) (Timmermann 1999). Hopley, Campaigning Against Cruelty, 9. Ryder, Victims of Science, 221. RDS minutes, 24 October 1928, p. 119, Well SA/RDS/C2. Robert Pearce and Warren Barr, Pearce & Stevens’ Trusts and Equitable Obligations, 6th edn (Oxford: Oxford University Press, 2015), 404–405. It is interesting to speculate on whether this decision would be upheld today, now the importance of wilderness is better appreciated (Pearce and Barr 2015). Memo from G.P. Crowd, honorary secretary RDS, 9 October 1934, Well SA/RDS/C2. RDS minutes, 19 March 1931, p. 135, Well SA/RDS/C2. RDS minutes, 11 March 1932, p. 145, Well SA/RDS/C2. Memo from G.P. Crowd, 9 October 1934, Well SA/RDS/C2. Vyvyan, In Pity, 9. Recent evolutionary theories suggest that the relationship is a biologically special one. For an overview of the coevolution of humans and dogs, see Raymond Coppinger and Lorna Coppinger. Dogs: A Startling New Understanding of Canine Origin, Behaviour, and Evolution (New York: Scribner, 2001) (Coppinger and Coppinger 2001). ‘Exportation of stolen dogs’, Bell’s Life in London and Sporting Chronicle, 28 May 1843, 1 (Exportation of Stolen Dogs 1843). ‘Dog’s protection bill’, Nottingham Evening post, 13 December, 1906, 6 (Dog’s Protection Bill 1906). House of Commons debate, 17 March 1905, Hansard, 143, c395. ‘The vivisection controversy’, Sheffield Evening Telegraph, 28 March 1906, 4 (The Vivisection Controversy 1906). Hopley, Campaigning Against Cruelty, 16–17. ‘Problem for speaker’, Manchester Courier and Lancashire General Advertiser, 17 July 1913, 5; ‘Protection of dogs from vivisection’, Times, 17 July 1913, 3 (Problem for Speaker 1913; Protection of Dogs from Vivisection 1913). Derby Daily Telegraph, 24 July 1913, 2. G.G. Greenwood, ‘Sympathy and practice’, Times, 24 July 1913, 14 (Greenwood 1913). ‘Experiments on dogs: medical protest against the prohibition bill’, Times, 21 April 1914, 3 (Experiments on Dogs: Medical Protest Against the Prohibition Bill 1914). ‘Operations on dogs’, Aberdeen Journal, 11 May 1914, 6. ‘London letter’, Western Daily Press, 22 March 1919, 4; ‘The vivisection of dogs: a reply’, The Fight Against Disease (1924), 9; ‘Medical research and the war’, Aberdeen Journal, 28 June 1919, 5 (London Letter 1919). ‘The vivisection of dogs: a reply’; ‘Dogs’ protection bill’, Yorkshire Evening Post, 27 June 1919, 8 (The Vivisection of Dogs: A Reply; Dogs’ Protection Bill 1919). Western Daily Press, 17 March 1920, 6. ‘The outbreak of rabies’, Times, 23 April 1919, 13 (The Outbreak of Rabies 1919). ‘The dogs’ protection bill’, BMJ, 1 (1919), 613–4; Letter from Arthur H. Jona, Hastings and St Leonard’s Observer, 12 May 1928, 10 (Jona 1928). ‘Bishop and science: reply to anti-vivisectionists’, Kensington branch minute book, 27 May 1910 [press cutting pasted in], SA/RDS/C16. ‘A new sort of postcard’, The Fight Against Disease (1922), 9. RDS minutes, 15 March 1920, 3, Well SA/RDS/C2. Founded as the London Anti-Vivisection Society in 1876, it became the LPAVS in the early twentieth century, though there were never any branches outside London. RDS minutes, 21 March 1923, 47; 22 May 1928, 113, Well SA/RDS/C2; The Fight Against Disease, n.d. , 4. BMA files, Well MP214 SA/BMA/C87. Charles R. Johns, ‘Petition to parliament’, Cornishman, 9 March 1927, 7; Hopley, Campaigning Against Cruelty, 5; Theodore A. Cook, ‘Dogs for research’, Times, 7 March 1927, 20 (Johns 1927; Cook 1927). Arthur Hollmann, Sir Thomas Lewis: Pioneer Cardiologist and Clinical Scientist (London: Springer-Verlag, 1997) (Hollmann 1997). Ronald Clark, J.B.S: The Life and Work of J.B.S. Haldane (London: Bloomsbury Reader, 2011) (Clark 2011). ‘House of Lords, March 31st, 1925’, The Fight Against Disease (1925), 13–14. In 1927, the Secretary of the RDS wrote to the MRC to reassure them that, every year, the BMA had ‘taken active steps in Parliament’ to prevent the passage of the various Dogs Protection bills, Well SA/BMA/C86. ‘Anti-vivisection bill’, Gloucester Journal, 6 December 1930, 12; ‘Vivisection bill opposed in public interest’, Western Daily Press, 15 December 1930, 5 (Vivisection Bill Opposed in Public Interest 1930). H.G. Wells, ‘The way the world is going’, Sunday Express, 24 July 1927 (Wells 1927). George Bernard Shaw, ‘These scoundrels!’, Sunday Express, 7 August 1927 (George Bernard Shaw 1927). ‘Notes’, The Fight Against Disease (1927), 30–1. Hopley, Campaigning Against Cruelty, 37–42. Letter from the medical secretary to the MRC, 11 March 1927, Well SA/BMA/C86. In some cases, BMA members obviously did not support their Council’s position: John Round was both honorary physician to the Anti-Vivisection Hospital and chairman of the BMA’s Greenwich division: Obituary, BMJ, 1 (1937), 1234. ‘What mankind owes to dogs’, Daily Chronicle, 8 June 1927, 4. House of Lords debate, 25 March 1924, Hansard, 56, c988. Letter from the medical secretary to the MRC, 11 March 1927: Well SA/BMA/C86. UCL archives, Kew (hereinafter, UCL) MSS add. 273. Ernest Starling, ‘On the use of dogs in scientific experiments’, n.d., Well SA/RDS C1. ‘Echo of dog-stealing case’, Dundee Evening Telegraph, 2 December 1926, 6; ‘Vivisectors and dog-thieves’, The Abolitionist, 1 December 1926, 139. House of Lords debate, 8 December 1926, Hansard, 65, cc1346–7. ‘Magistrate on sales in the Caledonian market’, (newspaper cutting), UCL Bayliss papers, MSS add. 273. Hansard, 8 December 1926, 65, c1345. ‘Who sups with the Devil…’, Anti-Vivisection Journal, June 1926, 71. M.R. Ellinger, ‘Antivivisection’ (newspaper cutting), 24 December 1926, UCL MSS Add 273. ‘Vivisection: professor charged with receiving’, Johannesburg Star, 9 December 1926. ‘Dogs for college experiments’, Dundee Evening Telegraph, 22 December 1926, 5. ‘Summons against a professor dismissed’, Western News, 23 December 1926, 2; ‘Dogs for experiments’, The Star, 14 December 1926 (Summons Against a Professor Dismissed 1926; Dogs for Experiments 1926). ‘Alarm among dog lovers’, Daily Herald, 23 November 1926 (Alarm Among Dog Lovers 1926). ‘Watch your dog’, John Bull, 4 December 1926. ‘Dog Burke and Hare’, Evening Standard, 22 November 1926; Robert Blatchford, ‘Betraying dumb friends’, Sunday Chronicle, 28 November 1926, 10 (Burke and Hare 1926; Blatchford 1926). ‘The dogs a college bought from a thief’, Evening News, 22 November 1926 (The Dogs a College Bought from a Thief 1926). ‘The dogs’ case’, The Fight Against Disease (1927), 3–11. ‘Dogs for experiments: 1,147 used at University College in two years’, Star, 14 December 1926. ‘A challenge to anti-vivisectionists’, The Fight Against Disease (1927), 15–16. ‘Stolen dogs case’, Daily Mirror, 23 November 1926 (Stolen Dogs Case 1926). RDS minutes, 7 December 1927, p. 107, Well SA/RDS/C2. Memo from Lovatt Evans, November 1926, Well SA/RDS/C2. ‘Speakers howled down: uproar at anti-vivisection meeting’, Daily Mail, 17 June 1927; Hopley, Campaigning Against Cruelty, 43. Sherrington, C. S. (2004). Paget, Stephen (1855–1926), rev. Jeanne Peterson M., Oxford dictionary of National Biography. Oxford: Oxford University Press. Retrieved August 9, 2015, from http://www.oxforddnb.com/view/article/35360.